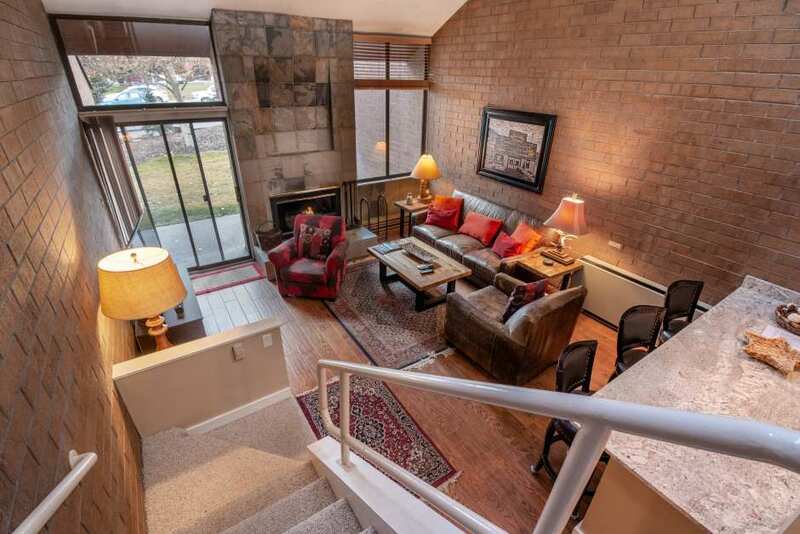 The Park Avenue condos are a legend in Park City, with a stellar location within walking distance to the slopes at Park City Mountain, and this one takes the cake! Beautifully renovated, this 2 bedroom , 2.5 bath condo will take your breath away from the moment you step through the door. Exposed brick lends a classic, utilitarian touch, which contrasts spectacularly with dove grey granite countertops and soft, supple, dark leather chairs and couches. This condo demonstrates meticulous attention to textural details, and has the gorgeous upgrades to prove it, from new wood/ceramic floors to every kitchen gadget you could dream of, to the new grill and private hot tub out in the private courtyard. Each of the bedrooms has its own en-suite bath. The master bedroom has a queen bed, as does the second bedroom – both are exceptionally large for this complex! The second bedroom also boasts a daybed and trundle, making it a great choice for couples and kids alike. There is also a queen-sized and a twin-sized inflatable mattress available, in case additional guests would like to sleep in the living room. This condo is just steps away from the city bus line, ready to whisk you away to the Sundance Film Festival, a day of golf, or to the base to hit the slopes if you’re not feeling like walking! The golf course provides beautiful views of summer fireworks and is a winter wonderland with limitless snow for the kids to enjoy. Numerous restaurants and shopping are only a quick walk or bus ride away, making each part of your vacation a breeze! Never worry about parking, either; this condo comes with its own parking spot in the carport. If you’re looking for the perfect condo in the perfect location for your visit to Park City, look no further than this dreamy two bedroom unit at Park Avenue. Copyright 2010 - 2019 © Resort Property Management. All rights reserved.